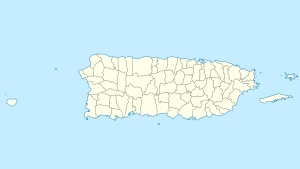 Ramey Air Force Base is a former United States Air Force base in Aguadilla, Puerto Rico. It was named after United States Army Air Forces Brigadier General Howard Knox Ramey. Following its closure, it was redeveloped into Rafael Hernandez Airport. In 1939, the U.S. Army Air Corps sent Major George C. Kenney to Puerto Rico to conduct a preliminary survey of possible air base sites on Puerto Rico. He examined a total of 42 sites and declared that Punta Borinquen the best site for a major air base. Planted sugar cane farms covered some 3796 acres that the government purchased for military use in the first week of September 1939 at a cost of $1,215,000. Later that year, Major Karl S. Axtater assumed command of what was to become Borinquen Army Airfield. With the establishment of an independent United States Air Force in 1947, the complex was renamed Ramey Air Force Base in 1948. Ramey AFB was home to a succession of Strategic Air Command (SAC) strategic reconnaissance wings and a bombardment wing, and housed a number of B-36 Peacemaker intercontinental bombers, albeit in its RB-36 strategic reconnaissance version. The RB-36s were later replaced by B-52 Stratofortress heavy bombers and KC-135 Stratotanker aerial refueling aircraft, while a tenant weather reconnaissance squadron operated WB-47 Stratojet and WC-130 Hercules aircraft. Due to the size and weight of the B-36, the runway at Ramey had to be built to a length of 11,702 ft and a width of 200 ft, with an added 870 ft Blast Pad at each end and an additional 50 ft shoulder on each side. The closure of Ramey Air Force Base began in 1971 as part of a SAC-wide reduction in bombardment wings and lasted until 1973. 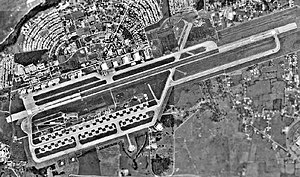 Following its closure, it was converted into a joint civilian-military airport with the U.S. Coast Guard comprising the remaining military aviation activities at the airport as Coast Guard Air Station Borinquen and Puerto Rico Air National Guard, Army National Guard and the United States Army Reserve maintaining non-aviation units. In 1971, as a result of the closing of Naval Air Station Isla Grande, the United States Coast Guard relocated its aviation activities to Ramey. The Coast Guard took possession of an outstanding hangar, a part of the Air Force housing area and the DoDEA Ramey School for the newly formed Coast Guard Air Station Borinquen. The Coast Guard Exchange system operates a CGX near the coast guard air station. The Punta Borinquen Light was also transferred to the Coast Guard. Punta Borinquen Radar Station near the Ramey Golf Course is a Puerto Rico Air National Guard facility, home for the 141st Air Control Squadron. The United States Army Reserve operates the Ramey United States Army Reserve Center. The Puerto Rico National Guard also has some Army National Guard units and facilities at the former Air Force Base. Military retirees choose to settle in the area mostly because of the Ramey Golf Course and services they are entitled to at the coast guard air station. Airport information for TJBQ at World Aero Data. Data current as of October 2006. This page was last edited on 5 December 2018, at 03:37 (UTC).